I have put the new Rowan British Sheep Breeds Fine Boucle in my shop. I like this yarn very much – it is soft and has a springy feel to it. Today we went to Cambridge to get some gaskets for John’s car. He decided he knew a better route that would avoid Cambridge City centre. As usual we got hopelessly lost and had not got a clue where we were. Eventually we found the way by going to Cambridge airport and re-routing from there. A new whistle came today!! I still think we will find the old one which I DID NOT loose! The answer to the last puzzle was “Business before pleasure” and Jacki, Christine, Maureen, Susan, Theresa, Mary and Janet were all correct. In this puzzle, each of the answers is one letter of the alphabet – all different. When you have found out what they are, you will be left with 6 unused letters which you need to rearrange to find a well known English word. 1. What letter’s column contains the free space on a bingo card? 2. Who is the puppet owl voiced by Fred Rogers on the TV show Mister Rogers’ Neighborhood? 3. What letter in Braille is the mirror image of the Braille letter E? 4. What is the first capital letter in the text of James Joyce’s Finnegans Wake? 5. What is the most common letter in the combined names of the nine planets in our solar system? 6. What character did Judi Dench play for the fourth time in a November 2002 movie? 7. What new letter rating has Roger Ebert advocated that the Motion Picture Association of America add to its system? 8. What is the country car code—the code seen on oval stickers placed on the backs of cars, especially in Europe—for Germany? 9. What letter indicates the first category on a card in the American Genus edition of the game Trivial Pursuit? 10. What letter is formed in the manual alphabet with the thumb on the palm and the other four fingers held together straight up? 11. What letter was on Larry Doby’s baseball cap in 1947 after he became the first black player in the American League? 12. What is the identity assumed by Will Smith’s character in the movie Men in Black? 13. What was Thomas Pynchon’s first novel? 14. What letter designation was given to first-class 29-cent U.S. postage stamps issued in 1991 before regular versions of the stamps became available? 15. What monthly women’s fashion and living magazine published by Fairchild Publications was sold to Condé Nast in August 1999? 16. What letter does Kent refer to as “thou unnecessary letter” in Act II, Scene 2 ofKing Lear? 17. What letter begins the serial number of a U.S. dollar bill issued by the Federal Reserve Bank of San Francisco? 18. What Mary Roberts Rinehart novel was the fifth-best-selling book of 1915? 19. What is the chemical symbol for the element also known as brimstone? 20. What kind of bomb was obtained by the Duchy of Grand Fenwick in order to win their war against the United States in the movieThe Mouse That Roared? Answers to jannette@easynet.co.uk by midnight Wednesday please with alphabet as the subject. Another fruitless search today! I took some photos of balls of Rowan Kidsilk Haze Trio and, on looking at the shade card, I saw that I had not photographed Loganberry. I went back to my store to get a pack and – guess what – I could not find any! Herculean hunt – no sign. On checking my delivery note from Rowan, I find that I did not order any! No wonder I cannot find it. Actually, this is a mistake by the Rowan rep as I told her I wanted all colours. Not to worry, I will order some tomorrow. I made some coffee and cream muffins yesterday – John liked them. Today I am cooking pork chops with roast potatoes, runner beans, stuffed onions, braised celery and carrots and butter beans. I am going to make a black currant fool for dessert. Not much other news – just hope I don’t lose anything else. I found my little tape measure – it had fallen off my desk into a shoe. No sign of the whistle tho’! Back tomorrow. Today has been the day of the lost keys! I went shopping and came home and wanted to go and get some yarn out of one of my sheds. John and I both have a set of keys and his were on the kitchen table but no sign of mine. He was out and so I used his set thinking that mine were in a coat pocket. They were not. I had to start a massive search – laundry basket, washing machine, bedroom floor, tables, desks and down the sides of chairs….no keys. I dreaded John coming back as sooner or later he would ask where my keys were. The missing whistle has not reared its head in the last 24 hours but missing keys wouldl revive the whistle problem! He came back and I went outside to speak and what did I see? The keys were hanging from a lock on another shed!! I but have left them in there yesterday! They are now safely in my back pocket. We are going out to eat tonight and then coming back to watch the Olympics. I enjoyed the opening ceremony but thought that some of it would have been a bit obscure for foreign people! I now realise I have lost my tape measure – it is a special miniature of a carpenter’s tape measure and I have had it for years. I wonder where it can be..off on another hunt! Back tomorrow. All the new Rowan yarn and books have just arrived – a mountain to sort out! Only things that did not come are Felted Tweed in Damask and Celadon. The new Kidsilk Haze shades are lovely and are in my store and I am putting everything else in as fast as I can! first and last letters reading down will reveal a proverb. OR, REAU, RI, RO, SI, STA, STA, STEP, TE, TOR, TUR, TUS, UL, VA. Answers by midnight Sunday to jannette@easynet.co.uk with puzzle as the subject. The war of the whistle is on! John is insisting that I lost Slip’s whistle whilst he was away. I know I did not! I took special care of it as I know how fussy he is about it. Now it cannot be found. It makes me so mad when he says I have lost it – I have not! Then, to make matters worse, at about 9,0pm last night I suddenly realised that my Tiffany gold bracelet was no longer on my wrist. I did not dare say anything especially with the lost whistle still clouding the air. I could not really look for it either as he would have asked what I was doing! So I spent all night worrying. This morning I decided that I could not have been without it for long as it is heavy and I would have noticed. I decided to re-track my steps from 8.0pm last night. 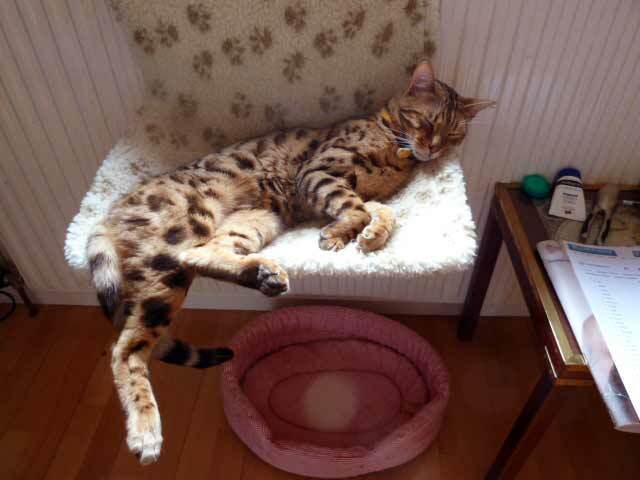 I had a bath – not in bathroom. Typed some emails – no sign in vicinity of computer. It is most likely to spring open when I take clothes off – inspected all clothes in laundry basket – not a whisker of a bracelet. Then I remembered, John had told me to go through the pockets of the coat I wore to walk Slip whilst he was away….he thought the whistle might be in a pocket. Although I KNOW I DID NOT loose the whistle, I did so. On opening the cupboard where the coat lives this morning, what did I see…….my bracelet on the floor!! Got to get on – postman will be here very soon…back tomorrow! Sorry, I have been feeling a bit under the weather. It is extremely hot here and it does not help when you do not feel well. We went out for a drink last night and someone came into the pub to say one of the tyres on John’s Jaguar was flat as a pancake. John went and looked and there was a screw in the tread. Luckily another customer had an electric pump and John pumped it up and it got us home. My Brooklyn Tweed patterns are delayed in Customs – I have paid the import duty and so they should come any day now. I have a headache today and feel under the weather. It is hot – Jackson and Slip are stretched out on the kitchen floor where it is cool! Now the contest! Janet, Jacki, Mary, Theresa, Maureen, Susan and Christine all found 25 or more words – my head is reeling from reading the lists! Think of an eight-letter word that is a method of cookings. The letters of this word can be rearranged to make two four-letter words, both of them names of herbs. What are these words? Answers to jannette@easynet.co.uk with herbs as the subject! Send by midnight Wednesday please. The Designer Yarns Bolero scarf yarn will be here on Wednesday – no hope of smuggling unless it rains and John goes fishing for the day! We are going to take Slip for a swim now! Back tomorrow. 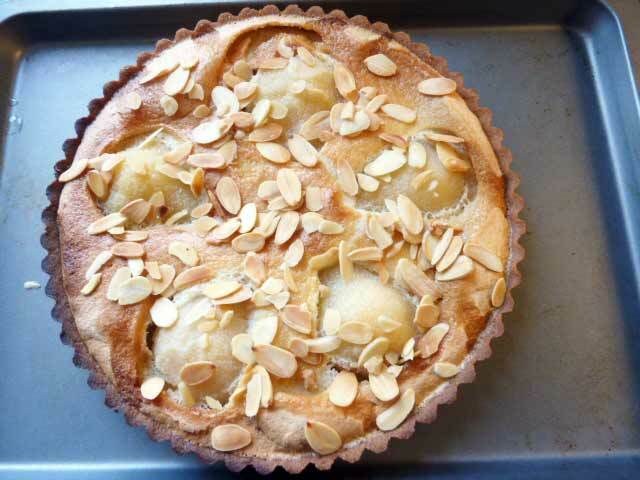 Here is my pear and almond tart. I have put pieces of marzipan inside the pears and the filling is an almond custard. I am going to make some chocolate sauce to serve with it. The seafood platter was not wonderful – OK, but not Wow! I would not buy it again. The lobster I ordered from Cornwall was much nicer. John caught 2 salmon yesterday just before they left. I am cooking roast beef with roast potatoes, carrots, runner beans from the garden and cauliflower in cheese sauce. Served with white wine! I weighed myself last night and I am 109 pounds or 7 stone 7lbs. I thought I would be more than that and so I am pleased! Nothing much else to report – I am going to tackle the mountain of ironing! Back tomorrow.